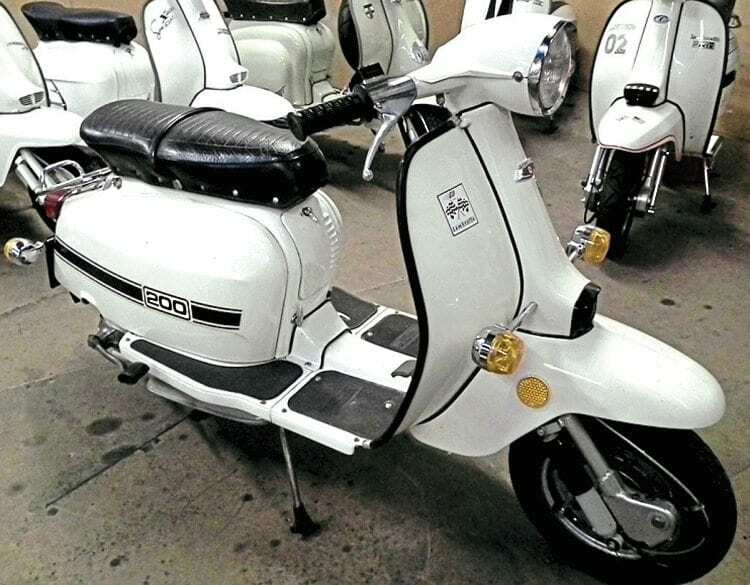 From ugly duckling to desirable swan… Banished in its time as a ‘non-Lambretta’ — was it the Scomadi or GTS of its day? The Jet 200 seen here in its original white livery which was probably the most stand out colour it came available. 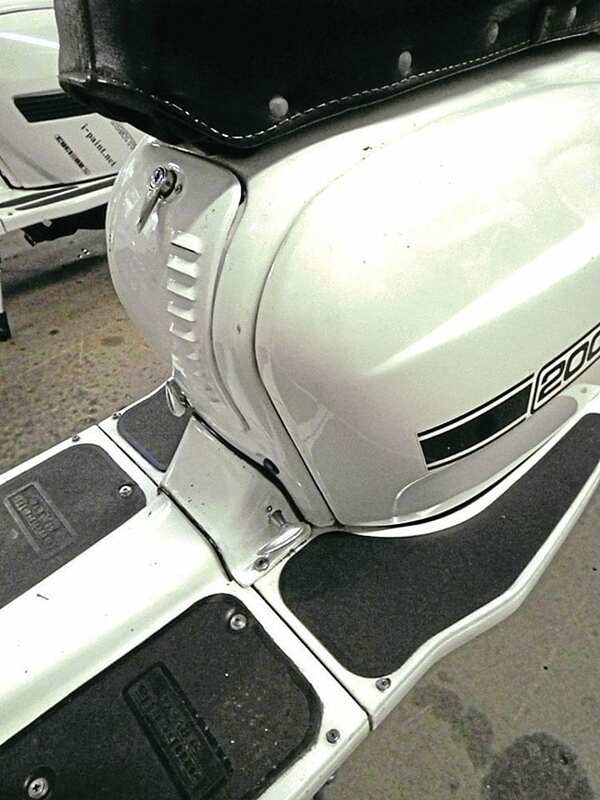 Over the last few years with the introduction of the Vespa GTS, and the Lambretta orientated Scomadi, there has been a certain amount of criticism aimed at both machines. From a purist’s point of view they are seen as the easy way out in terms of ready-made reliability, certainly when it comes to long distance travelling like rallies for instance. 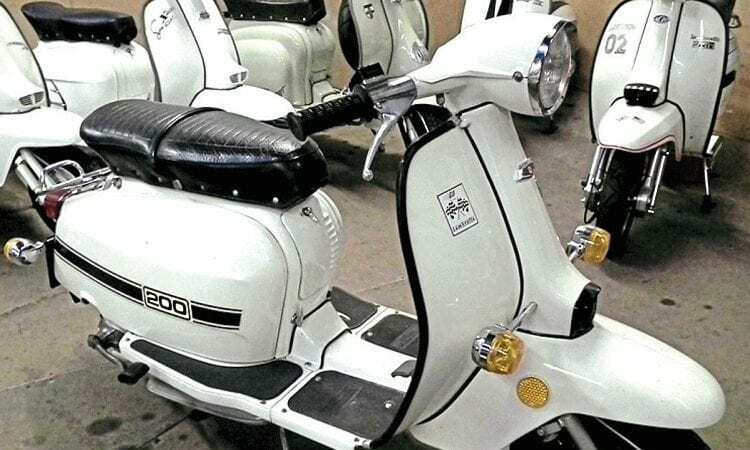 It should be the owner’s decision which scooter they wish to buy and if it is something more modern rather than vintage then that is entirely their choice. You must remember not everyone is mechanically minded so the temptation of proven reliability and easy maintenance will be appealing. There will always be divided opinion with the odd comment thrown in here and there that these are not true scooters but this phenomenon is nothing new. Unlike previous models the channel rubbers where done away with and it had black mats instead which wrere crudely glues on. 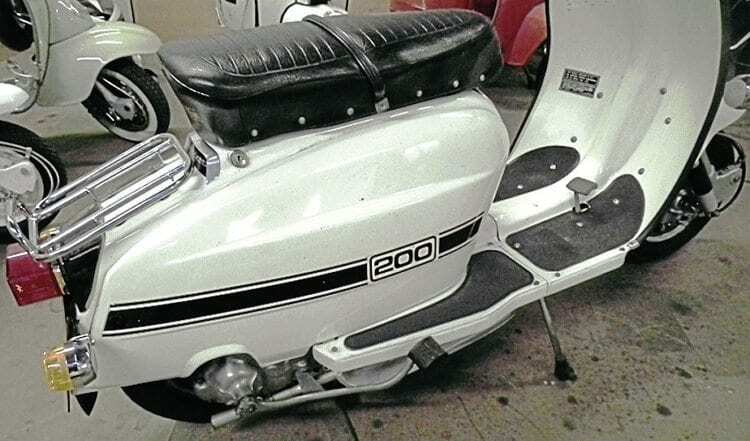 Back in the late 70s and early 80s the Spanish Jet 200 was creating the same scenario in the Lambretta world. Though they had been made under licence by Serveta since the late 1960s the later revised model created great controversy. This in a way was unfair criticism as the Jet 200 had served admirably after the demise of Innocenti production in 1971. Without it there would have been a massive gap in the market until the reintroduction of the Indian GP in 1978. 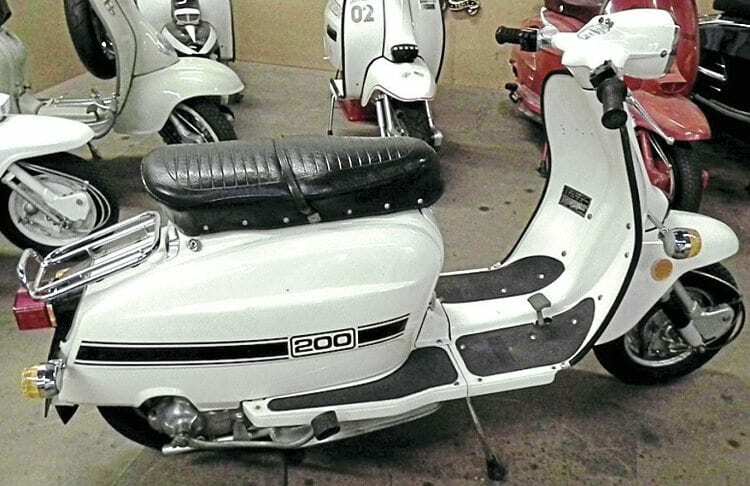 With the post Quadrophenia boom and mod revival in 1979 the Jet 200 offered the chance for the teenager to buy a new Lambretta opposed to an old one lying unused in a garage for years. Though they would cost considerably more than some old shed find, they were new, and supposedly with the most ‘up to date’ technology. The Li style bodywork at the front wasn’t the most appealing and even less so with factory specification indicators. To the majority they there were not seen as a Lambretta and never would be. If you want to be correct about it then they were not actually named a Lambretta but the Jet 200 built by Serveta of Spain. Quite often owners were ridiculed for the fact that they didn’t actually own a Lambretta and were ostracised to a certain extent. This stigma attached to the Jet 200 remained for decades until they started to become collectable during the last 10 years or so. Now original examples can fetch big money as they finally gain the status that in all honesty should have always been due. The reality was though, in some ways they were better built than their Innocenti counterparts. Even so the Jet 200 was not without its faults, so let’s take a closer look at its plus and minus points. The engine was similar in design and based around that of the Innocenti SX 200. Using the same top end configuration and carburettor, bhp would have been on a similar scale. The cylinder and piston were very well made and have proved reliable and hard wearing for many thousands of miles. The crankshaft likewise was well made but still only used the SX style flywheel taper and would have been much better had it been upgraded to the GP specification. Using a Spanish made Dellorto SH2O carburettor fuel consumption remained good and with a slightly larger fuel tank range was slightly improved. 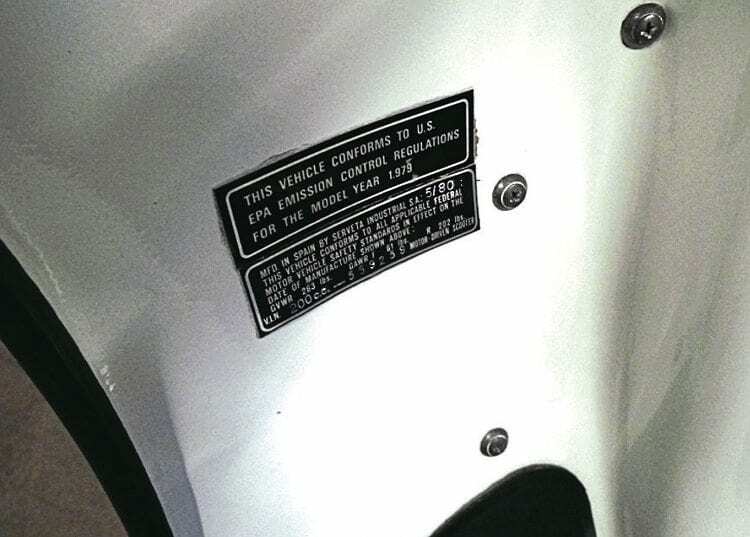 This US specification model came with the date of build and frame number displayed on the leg shields. The transmission and gearbox were also identical to the SX 200 and used the same set of gear ratios. The gearbox endplate being the only design difference as it was more robust than its Italian counterpart. One annoying and rather useless feature was the neutral indicator which worked by means of a contact switch that created a circuit when the selector on the layshaft was in the neutral position. Problems arose due to its inaccuracy and quite often the indication light in the headset would constantly flicker when neutral was selected. Also more concerning was the fact that if the engine jumped in to gear there was the odd case of the selector crashing in to the contact switch causing the casing to crack. It was not uncommon to see these removed and a blanking plate put in the top of the casing to prevent this from happening. Overall the quality of the casings was not that bad even though some threads would strip in the aluminium once a few years old. The components were of a very high standard and so was the assembly workmanship. Jet 200 engines were not only reliable but hard wearing and definitely a match for anything Innocenti made. In the minds of many owners the Jet 200 engine was seen as slightly superior in build and quality even if it did have the odd annoying part like the neutral indicator. 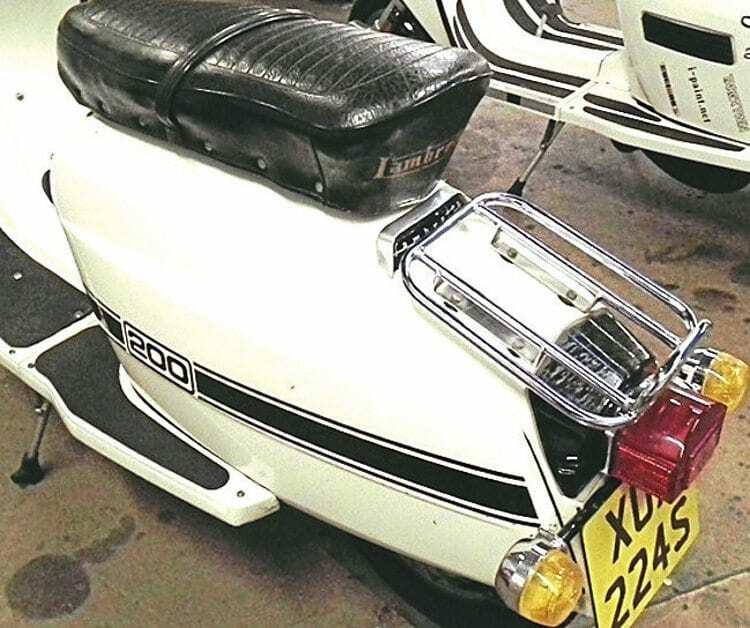 The styling of the Jet 200 was based around that of the Li series 3 Lambretta, except it still incorporated the heptagonal headset. Though the side panels on early versions of the Jet 200 were the same as the SX 200, by the time this version had come out they had reverted back to the Li style. Unfortunately this did make the Jet 200 look rather plain, especially with its monotone colour and lack of badges, in some ways it was rather boring. The paintwork of metallic blue or green, even though it wasn’t the brightest, was offset with a black strip down the side panels, emblazoned with the 200 logo. Later in production there would also be a choice of black or white which did look better. The louvred tool box door for the air supply intake in to the engine via the filter. On the side of the bridge piece, the new position of the petrol tap can be clearly seen. Probably the biggest change was to the tool box. By doing away with the air box the air filter would now be situated in the left hand side of the tool box. This was crudely separated by a divider which was spot welded to the tool box door. The door would also be vented to allow an air supply in. The problem was this made the already small tool box almost unusable with only just enough room for a small bottle of oil and spark plug spanner. Whatever the thinking was to do away with the air box is unsure but it certainly wasn’t the best idea. The other notable change was to that of the petrol tap fixing. This had always been a problem on the Lambretta due to the poor and rather flimsy fitting of the petrol tap rod. The answer on the Jet 200 was to do away with this by using a remote petrol tap on the side of the bridge piece. Though the petrol rod problem was solved this now meant that a pipe from the tank had to feed in to the tap with another pipe exiting the tap back to the carburettor. The famous head set warning light system that was a nightmare to wire and remininscent of a fruit machine when lit up. With minimal room for the pipes it could lead to problems if the tap needed cleaning out. Also there was a tendency to lose fuel flow pressure on a low tank which could lead to fuel starvation problems due to the elongated fuel pipe length. Though the petrol tap rod problem had been solved another had been created with its design replacement. The tanks and cowlings were now finished off in a hideous dull green colour reminiscent of some kind of military vehicle on some examples while there was a more sedate silver on others. Despite the few oddball discrepancies with the air box and fuel system the overall workmanship of the Jet 200 was to a high standard. So too were the steel pressings of all components from panels to cowlings which didn’t suffer from ripples or poor edges. On a final note was the rather bizarre styling of the rear light unit. Rather than sit in a recess like on early Jet 200 examples following the Innocenti design the whole rear light unit doubled in size and protruded out the back of the frame. This was probably due to new regulations at the time requiring a much larger rear light. The rather large rear light unit that was not only ugly but prone to being broken as it was so exposed. The down side, it was prone to being broken off as it was easy to bump and there was no protection. Its design also created a new sport among the biking fraternity post Mod revival, who would attempt to boot them as hard as possible resulting in the whole unit being completely smashed off. The front brake would be similar to the Li, utilising the old tried and tested drum design. This again was a backwards step as the earlier Jet 200 had been fitted with a disc brake. It may have been due to the extra cost that it was now equipped with a drum brake instead which was just about adequate in terms of stopping power. Even so the front forks were now fitted with dampers as standard even if they were rather large and hideous in looks. This is something Innocenti should have done on all models and not just those with a disc brake as its stops the rather sharp diving experienced when front dampers are not in place. The rear hub retained the drum set up used for decades but the hub was far more robust. 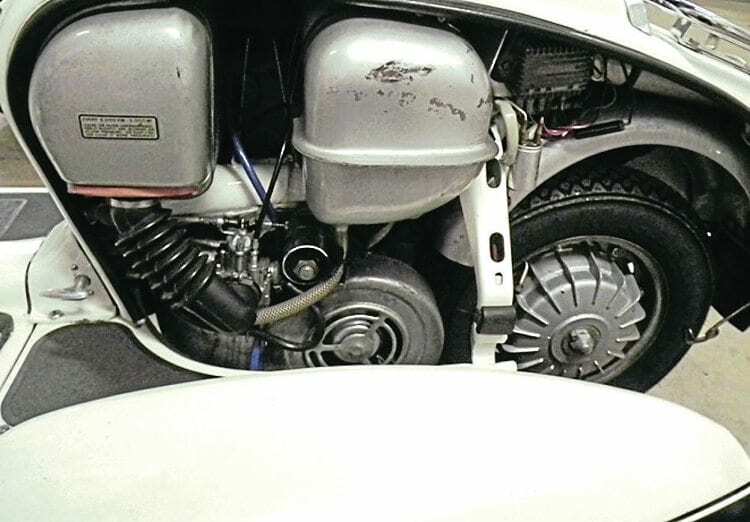 This was a vast improvement in strength over the old Innocenti design and these hubs would fetch a premium as they were far safer for highly tuned Lambretta engines, predominantly for scooter racing. The rear shock absorber would also be beefed up with much wider frame and engine mountings as well as an up rated spring. Again this would give a much improved ride certainly two up and was an improved safety aspect. When it comes to the wiring and electrics of the Jet 200 one must wonder what the hell they were thinking when they designed the layout. Not only was the wiring system immensely complicated it was also cluttered and untidy. Even a degree in astrophysics would not be enough to work out the mass of tangled wires that made wiring the space shuttle look a doddle. The problems stemmed from the amount of warning lights, switches and indicator system that worked their way around the frame. 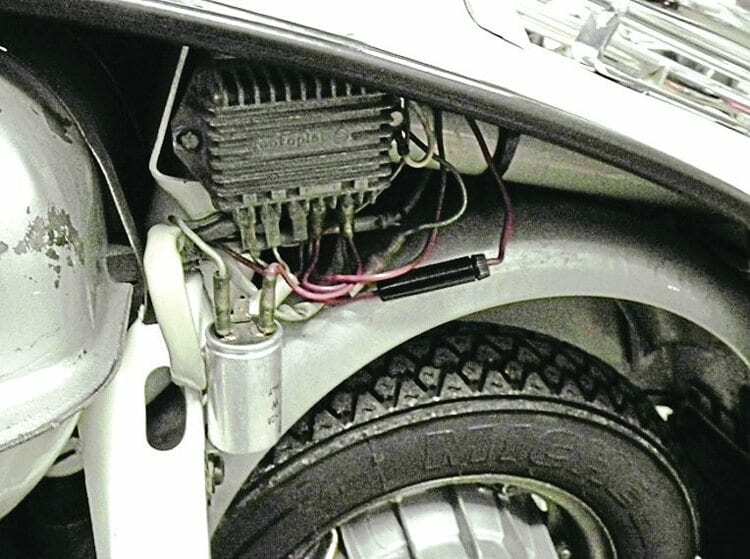 Initially the system was fed by a Motoplat 6V ignition system which in all honesty could have done with being 12V for the amount of systems it had to run. From here it fed in to a regulator which is where the complicated journey began. Feeding to a rather large capacitor for the indicators which was crudely tied to the frame with a rather odd black rubber band this signalled the troubles that lay ahead. There was a mass of wiring which fed off to each indicator that then backed up to the head set where the switch that controlled them was placed. This was combined with a wire from the back of the engine up to the head set for the neutral indicator light. The light was tightly crammed above the speedo with another for the indicators and one for a newly incorporated feature, a headlamp flash. Just the regulator alone was a mass of wires which seemingly made their own mind up as to where they went in to the abyss of the Jet 200 wiring system. This is where the real problem lay as there was now a mass of wires in to the head set and to compound matters further quite often not colour coded. Just when it seemed things couldn’t get more confusing the traditional ignition which acted as a switch on previous models was now done away with. With the extra switches this meant that the gear change on the handle bars would have to house a switch as well, complicating the wiring even further. For the final twist in the tail the ignition on/off switch was removed from the headset. With what was seen as the crowning glory of the ludicrous wiring design the switch was now placed at the rear of the frame on the right hand side just to the edge of the rear frame badge. This allowed for two things — another set of wire feeds along the frame and the unwelcome opportunity to cut your leg open as you got on the machine since the ignition key jutted out from the side. Not forgetting those that wished to fit a Snetterton seat would now need to cut out a small recess at the back to fit around where the key went. The air hose fixed directly in to the bottom of the tool box now the air box and scoop were done away with. There was no doubt that the wiring on the Jet 200 was a complete enigma not only to owners but probably to those that fitted it in the factory. While it worked all was fine but once there was a problem the best thing to do was pray. Serveta did supply a small wiring diagram that came with the instruction manual but it would be easier to read Egyptian hieroglyphics than try to decipher what was actually printed in the manual. It was a token gesture at best in all probability as they couldn’t understand it themselves. The Serveta Jet 200 overall was a good well-built machine. Though it had its faults, certainly with its wiring, it proved on the whole to be reliable. It’s fair to say that styling wise it lacked the clean lines of its Innocenti counterpart and could have done with a slight revamp. Though there were some improvements not all were designed that well, which if anything was its only downfall. The side panel flash reminiscent of the Italian Grand Prix model. Note the odd position of the ignition switch just below the bottom left hand corner of the seat; what on earth were they thinking when positioning it there. Whereas certain aspects were well thought out, this helping with the machine’s longevity. There are many original examples still being used today, which demonstrates how its exemplary build quality has stood the test of time. 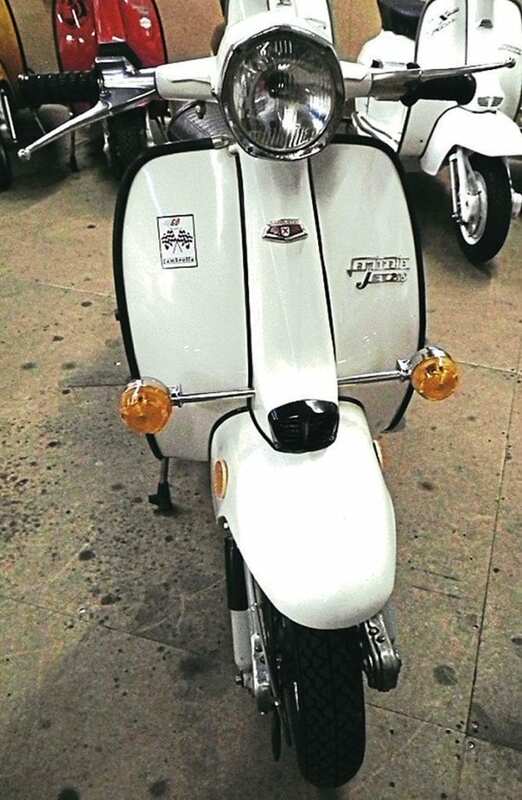 With the ridicule attached to owning a Jet 200 long gone it can now finally take its rightful place as an iconic machine among Lambretta owners. 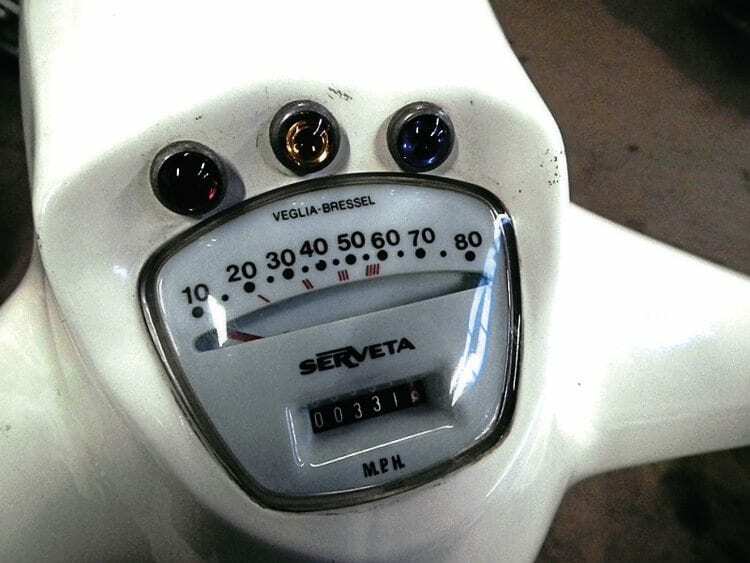 Next Post:Scootering classics: Lambretta essential maintenance – erratic tick over: ignore it at your peril!